The Garden of lights returns to Emperors Palace bringing festive cheer to all of its guests. 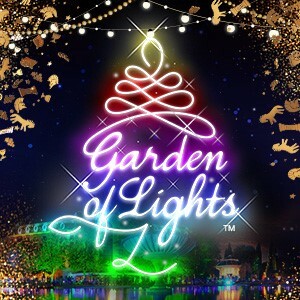 Now in its 11th magical year the Garden of Lights combines beautiful light displays, Christmas music and fun characters to create a truly unique experience. For the first time in South Africa, illusionist Ryan Sharp will present his incredible show, The Magic of Christmas. A fun-filled 50 minute, interactive magic and illusion show for the entire family to enjoy.The show runs alongside the Garden of lights with performances at 6pm and 8 pm. Tickets can be purchased together with a Garden of Lights ticket for a discounted rate. Step into a festive season wonderland at the spellbinding Garden of Lights, featuring dazzling lights and colourful Christmas characters, in the perfectly manicured gardens at the 5-star Peermont D’oreale Grande hotel, at Emperors Palace. The lights spectacle is the perfect night out for families, complimented by a variety of exciting funfair rides and stalls selling food and beverage will be available, together with festive season paraphernalia. Come and join us this festive season between 30 Nov 2018 to 2 Jan 2019.